Whitby Town make a first-ever trip to Halesowen’s 140-year-old Grove ground this weekend, keen to kick on from a first away win since October, at Grantham, last Saturday. The West Midlands club, known as the Yeltz, have scored just three goals in eight games, with three goal-less draws in that time, including a stalemate at the Turnbull Ground, just two weeks ago. Their ex-Coventry City frontman Iyesden Christie notched in a 1-1 draw at strugglers Frickley Athletic on Tuesday night. Halesowen, who were promoted through the Evo-Stik First Division South play-offs last season, currently sit 11th. From 1985 to 1991, Halesowen, who also played back to back FA Vase finals in ‘85 and ‘86, reached the first round of the FA Cup for seven consecutive years. The Seasiders have netted just five times in their last ten away trips. Dave McTiernan’s winner at Grantham was the midfielder’s tenth of the season and he leads the Blues’ scoring charts. Admission at The Grove is £10 for adults, £7 for senior citizens and under-21 students with a valid NUS card, while under 16s pay £3 and under 12s accompanied by a paying adult are admitted free. Whitby are back at home seven days later when Barwell visit the Turnbull Ground, with a 3pm kick-off. 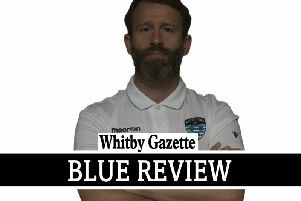 Meanwhile, people can snap up tickets for Whitby’s end of season presentation night which will take place on Saturday May 2 at the Stables Restaurant, Cross Butts. Guests include comedian Kevin Connelly and admission is £20. Please see John Tyreman, Martin Hart or Graham Manser to reserve your ticket.